Just when I was dreaming about the welcome arrival of Spring, dry roads, new kit and fresh tyres, it seems winter has finally decided to bite me on the arse. Mid-January delivered a series of frosty mornings, sub-zero temperatures and the odd flurry of snow followed by more heavy rain. My 90-mile each way commute from Yorkshire to Peterborough has not been fun and I even had to wire my Keis heated jacket to the bike as layering up simply wasn’t enough. With the Gear Gremlin heated grips (£44.99) on full blast and the Keis jacket set to maximum it just about became bearable. The taller Powerbronze screen (£59) has improved wind protection, but the harsh January weather once again highlighted the Suzuki’s failings as a tourer as the bodywork doesn’t give enough coverage. Cold weather aside, the Suzuki has just returned from its 7500-mile service – which takes three hours and costs around £270 depending on the dealer. The spark plugs and engine oil have been replaced, but not the filter and coolant. When it returned from Suzuki it looked brand new. With the service done, I’ve treated the GSX-S to a few late Christmas gifts. Although the standard exhaust doesn’t sound bad, with a noticeable change in the tone in the mid-range, I’ve still decided to release a few more decibels. 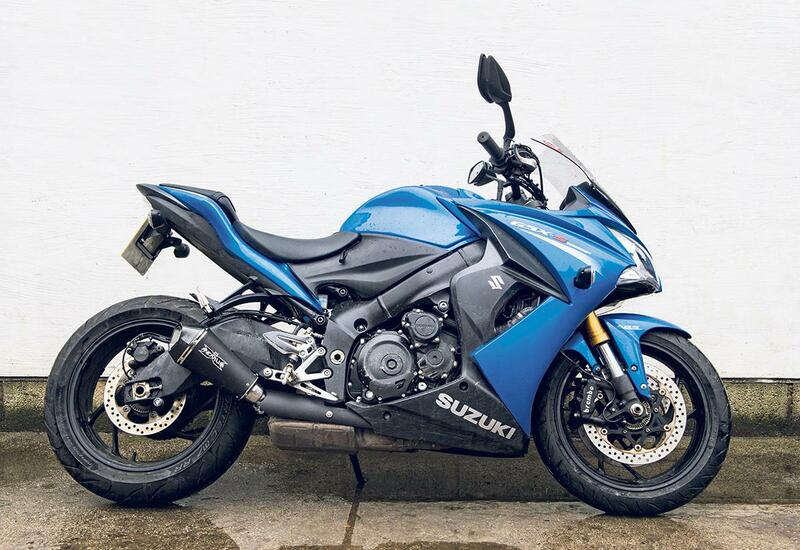 A slip-on, road-legal Remus end can (£442) improves the Suzuki’s looks and just adds a little extra rasp. It took less than 10 minutes to fit, comes with a replacement heat shield and a new bracket using the same location points as the standard exhaust. As it’s only a replacement end can and not a full system it’s not annoyingly loud, just noisy enough to make other road users take notice when I‘m filtering down the A1 on the way to work. It certainly shouldn’t upset the neighbours. I’ve also fitted some Yoshimura paddock stand bobbins (£27) and some crash protection. The bobbins are a little trinket that makes it easier to hook the Suzuki up on a paddock stand. The crash protectors are obviously useful in the ‘highly unlikely event of an accident’. At £248 they’re not cheap, but look great and will save on the repair bill if the bike does have a mishap. Both items are a doddle to fit, done in less than 10 minutes. I’ve also opted for a Yoshimura tail tidy (£108), which I was hoping would neaten up the rear end, make it sharper and appear more aggressive, but I’m a little unsure if it has. It looks OK but I’m not 100% happy with the end result and it was a pain to fit. The wiring was simple enough and, surprisingly, removing the standard rear numberplate holder was also pretty straightforward. 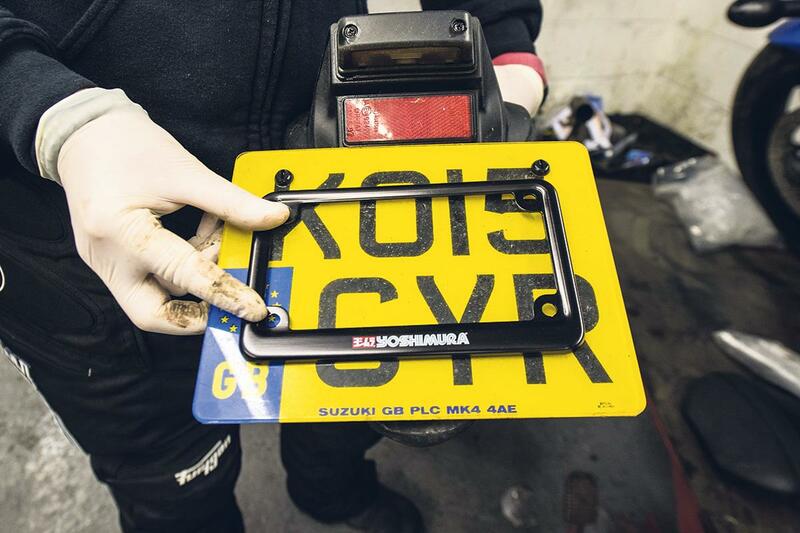 The problem is that the Yoshi tail tidy was designed for the American market, therefore the actual number plate holder isn’t large enough for a road-legal UK plate. We had to drill new holes in the standard plate to make it fit and the reg covers the all-important Yoshi logo and bracket. Secondly, the US outer plate bracket didn’t sit flush to the mounting bracket, so we had to grind a little bit away to make it a perfect fit. In all it’s a bit disappointing, especially considering the bracket costs over a ton. I’ve fitted lots of Yoshimura parts to bikes previously, from full race exhausts to paddock stand bobbins, and I’ve always been impressed with the quality but not this tail tidy. To add injury to insult I’ve now lost all the weather protection offered by the Suzuki’s standard rear numberplate and hanger. Riding in the wet results in a huge rooster of spray which then covers my back, pillion or rucksack; fitting the tail tidy wasn’t my greatest idea.